You all are very familiar with Torrent downloads and Dropbox cloud computing application. After the success of Dropbox, especially when your Dropbox space is increased every time you add up files to your Dropbox folders. Dropbox has made things more available, sharing of documents has been more easy. All your documents are available on your desktop, Laptop, tablets and even your mobile phones. 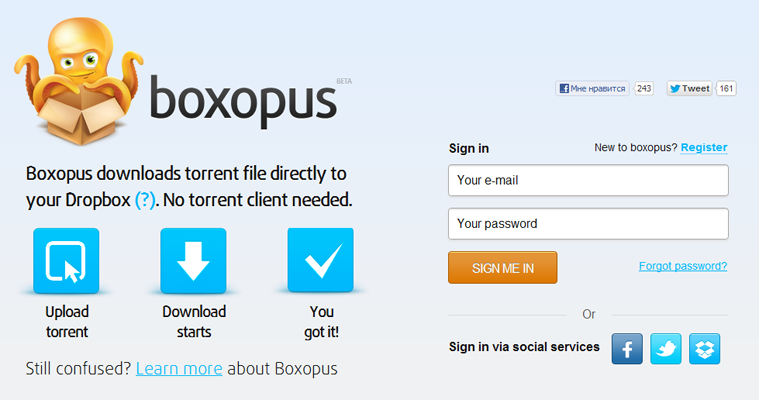 The same way the new web application called Boxopus, has made Torrent downloading more easy. This application needs to be logged in and connected up by the Dropbox account. The working of the downloads of the Torrent files starts with just a few clicks. You need to assign the downloaded torrent file and it will directly sync up with the leechers and add up the downloaded file in your Dropbox folder. Boxopus will make its folder in Dropbox (Dropbox > Apps > Boxopus). Since the application is build up on Dropbox API, it is secure and safe. The downloading location is also specified, so other Dropbox files also stay untouched. The application is free of cost as if now, but can’t say till when the services will be free. There are many such paid services too. To use Boxopus, you need to create a new login ID or can do a login via social services like Twitter, Facebook or even Dropbox. 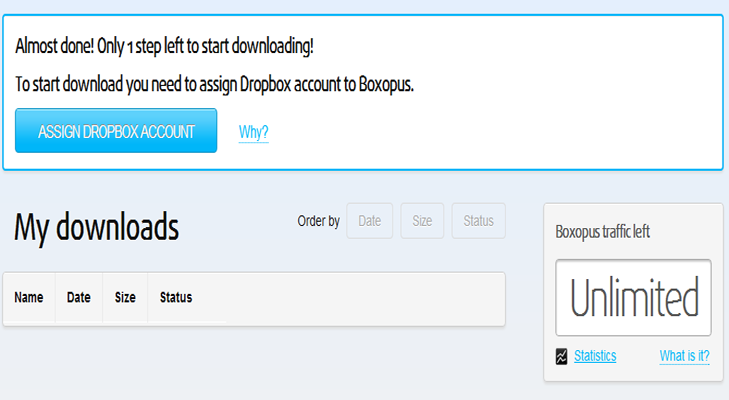 Once you do a login to Boxopus, you can view a button which reads ASSIGN DROPBOX ACCOUNT, then you need to do your Dropbox authentication to connect the account. Then you can simply add your downloaded Torrent file by clicking onto the BROWSE button and click on PUT IN MY DROPBOX button. Once the downloaded from the Boxopus server is complete, it will sync all the downloaded files to the installed Dropbox client device. This third party application has made Dropbox more familiar among other cloud storage providers like Microsoft Skydrive, Google Drive, box.net. Though Dropbox gives you a storage of 2GB initially but it adds up your space when you sync your documents, photos, movie clip directly to Dropbox. So it provides more space when you start using the Dropbox regularly. I have tried the application and used it, the application is very smart to download the file and manage it in such a way to directly transfer the file to the Dropbox account. This may slow down Dropbox box because it when huge files are synced with various IP addresses. The best part is that the server-side application takes care of all you’re downloading part without the BitTorrent client installed at your end. Another feature is that, once you add your Torrent files, it anonymously downloads the file from various providers and it won’t bother you if there is any blocking of sites done at your end. Since the Boxopus is in beta stage, the application is also loaded with lot of Torrent files which in response is giving the error that “Due to recent traffic burst we might delay some torrents!”. I suggest you to try this application after some time. I used the application yesterday and it was working fine, but by evening it was slow. I hope you will be enjoying your Torrent downloads from Dropbox now on. « Looking for a fancy email ID with a custom domain name?